Unfortunately not all countries are lucky enough to be blessed with regular snowfalls or mountains of great height. However, this is not to say that snowboarding doesn’t take place in such locations. 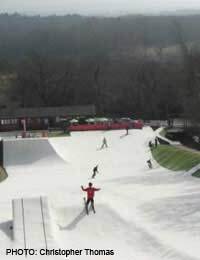 The invention of the dry ski slopes and snow domes allow skiers and snowboarders to learn, practice and improve their slope skills all year round. These are built from man made materials that mimic snow and allow you to slide over their surface. Though they are not the same as snow, they still provide a good place to learn. Normal snowboarding equipment is used on dry ski slopes, although the surface material creates more friction than snow, so will result in greater wear and tear to the base of the board. Dendix A giant lattice made of plastic brushes. Often the surface will have sprinkler on it to reduce friction. The downsides to Dendix are that it hurts when you fall, and it’s easy to catch fingers and thumbs in between the lattice. Dendix is slowly being replaced with SnowFlex. SnowFlex- A more recent invention and much improved surface, SnowFlex looks like carpet and has a layer of cushioning built in to help ease the pain of falling over. SnowFlex is also less damaging to snowboards and skis than Dendix. SnowFlex slopes also use a misting system to help lubricate the surface resulting in a faster, smoother ride. SnowFlex has revolutionised the dry slope scene and allowed the creation of SnowFlex terrain parks with large jumps and even half pipes. Dry slopes are outdoors, so dress appropriately for the weather. Don’t bother buying the iridium lens goggles quite yet? A pair of old trousers, a hooded top and some old gloves will suffice. Dry slopes, (especially Dendix) are abrasive surfaces and can hurt if you fall over on exposed skin, so make sure you cover up. Long sleeves and trousers are a must. On the flip side, once you’ve mastered snowboarding on a dry slope, you’ll be able to handle anything that real snow can throw at you. Snow domes are a more recent invention that consists of a giant indoor freezer, where machines manufacture real snow. The UKs indoor snow scene is booming and has been the training ground for many British pro-riders. The advantage of domes is that you get to ride real snow, without having to leave the country and they are open all year round.There are also snow domes in Holland, Belgium, Japan, China, even Dubai! Inside the dome, the temperature remains around +5C, so you won’t need expensive outerwear, just dress as you would for a cold winter’s day, but avoid demin. A one hour group lesson will cost you around £27/hour including board, boots and binding hire. Snowdomes are important in promoting British snow sports, but the environmental impact of snow domes are in question due to the huge amount of energy they require to keep cool, especially in warmer places like Dubai and Shanghai. Dome and dry slopes are the breeding grounds for British, Dutch and Belgium snowboarders and represent an entire snowboarding sub-culture unto themselves. Open all year round and often till late, just get on the net, find your local slope, book a lesson, and take your first step into the world of snowboarding. You may break your bones, but at least you won’t break the bank.